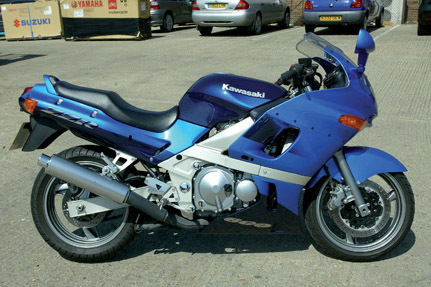 Back in the mists of time (1990 to be precise), Kawasaki launched two rocket ships. Strange with hindsight, but at the time of their birth, both the ZZ-R1100 and ZZ-R600 were cutting edge sports tackle and fast as hell. 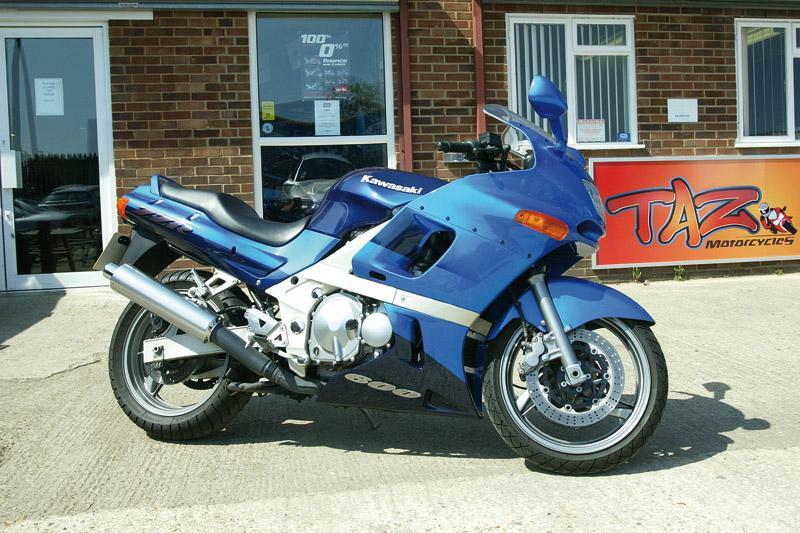 Then FireBlades and R6s came along and the Kawasakis lost the zeitgeist but the speed never dropped. Focussing on the 600, it was a straightforward, 599cc inline four built into the body of an ocean liner. Man, this thing was huge. And comfy. And the combination of a low, squashy seat, vast, protective fairing and a 14,000rpm redline equalled raised eyebrows and the ring of cash tills. Right up until its demise in 2006, the ZZ-R600 confounded biking fashion pundits by remaining popular despite their guffaws at its antiquated appeal. But perhaps they never rode one. With its outdated styling, Kawasaki never really bothered to update the weighty, Starship Enterprise look but, frankly, they didn't need to. Since the mid 90s, there's been no shortage of slithery, sporty middleweights to choose from. What kept the ZZ-R in a class of its own was its refusal to join the sports party. It was a lump: chunky, overweight (despite an aluminium frame) and not exactly beautiful. But fire it up, bung some luggage on it and watch it fly. A reliable inline four, knocking out 99bhp and 47lb.ft of torque. Sub-4000rpm it's got enough welly to haul you away from the lights but above that you're really talking. Versatile and sturdy, they go on forever and complaints are few. It's okay but veers towards sogginess quickly: this is exacerbated by the bike's weight and makes for a disconcerting lack of feel on the road. Firmer fork springs are virtually a must on older models. Be aware that pre-1995 bikes had no adjustment; post-1995 bikes got adjustable preload and rebound damping. Likewise, rear shocks are often replaced, too. Hagon seem to be the most popular choice with owners and are reasonably priced at £255 inclusive of VAT (www.hagon-shocks.co.uk). Exhaust headers and downpipes are the first part of the bike to succumb to rust and most owners fit aftermarket, stainless steel replacements. Motad do a downpipe system and collector box for £240. For complete systems, Nexxus do one (4-1) for models D1 to D3 for £360 and, for the E series, another system (replicating the original 4-2 configuration) for a rather whopping £480 (www.motad.co.uk). Prices don't include VAT or delivery. Apart from that, the bike's finish isn't too bad. Like many older Kawasakis, the ZZ-R's carbs may succumb to icing. It tends to happen in cold, damp weather (a typical, British winter then) and signs include poor starting and running, irregular tickover and a sticking throttle. The best way to deal with it is to use Silkolene Pro FST fuel additive, which dissolves ice as it forms in the carbs. Have a look on www.silkoleneoil.com for retailers. They need regular cleaning or the calipers easily get bunged up. As standard, they're passable rather than great, despite the massive 300mm discs, so many owners opt to fit upgraded pads and braided hoses, which give a bit more confidence. The gearbox is clunky and owners report missing gears as a fairly regular occurrence. It's fairly solid, though. Keep the chain under surveillance, they need lots of TLC: cleaning, lubing and adjusting. They last well if you look after them. Centrestand, grab rail, bungee points plus all the goodies on the dash: fuel and temperature gauges, analogue speedo and rev counter and a digital clock. There's a lockable compartment, too. A useful (and standard) part but many owners remove them as it grounds out early. These can, and do, go wrong but replacements are easily found. Try www.lm-spares.co.uk for one at £49.99 plus VAT. Need regular checking as they can wear quickly, but they're easy to replace. If you avoid going too berserk you can see up to 200 miles out of a tankful but 170 is more realistic, that's around 45mpg which is hardly bad news. A Big Plus. The ZZ-R is made for speeding in comfort. The lovely seat is wide and low, making the bike popular with smaller riders, while the reach to the bars and pegs feels natural. The screen and fairing work very effectively too. With a 16-year life span, parts for the ZZ-R are not in short supply. Popular modifications illustrate the bike's wide appeal: you're just as likely to see rearsets, loud cans and tinted screens as you are sensible exhaust systems and luggage racks. Sport/touring tyres rule here. Bridgestone BT021s remain popular, alongside Michelin Pilot Road and Pirelli Diablo Stradas. Expect to pay around £165 a set. As the machine is being discontinued, used prices may suffer as dealers discount new bikes to shift stock. As it is, if you're a seller, biggest losses will go to those who bought a ZZ-R new in 1995 or 1996, when list price reached a heady seven grand. High mileages are common and that can push resale value down but a well-kept model will still sell well at a reasonable price: ZZ-Rs have fairly passionate and loyal owners and ZZ-Rs not as threatening to newcomers as more modern sports bikes. There have been a few... E1 and E2 models had swingarm welds that could fail, so a recall replaced the arms themselves. E2 and E3 models could suffer drive chain failures so these were replaced and on the F1 the same chain problem could happen, and the tools could fall out of the bike onto the rear wheel! Soon cured with another mounting strap and an additional cover. Comments: The originals, which are pretty ancient now and likely to be looking the worse for wear. Pre-adjustment suspension means wallowy fork hell. Still plenty about and if you find a good 'un you won't have to part with too much cash. Comments: After the big overhaul there was new bodywork with twin ram-air ducts plus new silencers and minor engine modifications. The instrument panel had a facelift and got a fuel gauge: still no suspension adjustment on these models. Comments: All boast the suspension upgrade. Subsequent improvements included a digital clock (E4 model onwards) and an alarm/immobiliser. Right up until its demise in 2006, the ZZ-R600 confounded bikin fashion pundits by remaining popular despite their guffaws at its antiquated appeal. But perhaps they never rode one. With its outdated styling, Kawasaki never really bothered to update the weighty, Starship Enterprise look but, frankly, they didn't need to. Since the mid 90s, there's been no shortage of slithery, sporty middleweights to choose from. What kept the ZZ-R in a class of its own was its refusal to join the sports party. It was a lump: chunky, overweight (despite an aluminium frame) and not exactly beautiful. But fire it up, bung some luggage on it and watch it fly. Engine: A reliable inline four, knocking out 99bhp and 47lb.ft of torque. Sub-4000rpm it's got enough welly to haul you away from the lights but above that you're really talking. Versatile and sturdy, they go on forever and complaints are few. Front suspension: It's okay but veers towards sogginess quickly: this is exacerbated by the bike's weight and makes for a disconcerting lack of feel on the road. Firmer fork springs are virtually a must on older models. Be aware that pre-1995 bikes had no adjustment; post-1995 bikes got adjustable preload and rebound damping. Rear suspension: Likewise, rear shocks are often replaced, too. Hagon seem to be the most popular choice with owners and are reasonably priced at £255 inclusive of VAT. Is Kawasaki’s electric bike getting closer?